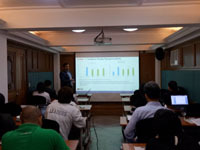 SINGAPORE (June 13, 2018) – Since 2017, Kemin Industries has organized several seminars in various regions to introduce Aleta™. 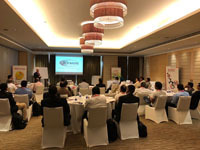 Kemin has continued to provide seminars to existing and potential customers as a value-added service to ensure they are aware of how to achieve the best possible outcome in their animal production. DES MOINES, Iowa -- Today Kemin Industries announced the creation of a Canadian division and will hold a grand opening and ribbon cutting ceremony on January 18, 2018, at its new location in Mont-Saint-Hilaire, Quebec, Canada. Kemin has acquired the assets of its long-time distributor Agri-Marketing Corp. Agri-Marketing was founded in 1973 in Mont-Saint-Hilaire and has provided exclusive distribution and manufacturing services for Kemin products in Canada. INDIATUBA, Brazil – On December 15, Kemin received the maintenance of the Sindirações certification for the Feed & Food Safety Program at its manufacturing facility in Brazil. DES MOINES, Iowa – Kemin, a global nutritional ingredient manufacturer, launched its BetaVia™ product line at the SupplySide West tradeshow on Wednesday, September 27 in Las Vegas. The new product line contains two algae-sourced, GMO-free beta-glucan ingredients for immune support. DES MOINES, Iowa – Kemin Industries, a leading provider of shelf-life extension and food safety solutions for food and beverage industries, has added a new color protection simulator to its website for their North America Food Technologies division. Kemin Industries has announced Greg Wyman as Director of Operations, effective immediately. Wyman will oversee the fully-integrated blending facility in Sarcoxie, Missouri and the liquid palatant and spray-drying facility in Verona, Missouri. The two high-tech facilities produce the highest quality palatability enhancing technology and performance ingredient solutions available to global petfood manufacturers. DES MOINES, Iowa (June 19, 2017) – Kemin Crop Technologies, an initiative of Kemin Industries focused on providing solutions for commercial horticulture, has appointed Emily Fuerst to the newly created role of research and development director, effective immediately.